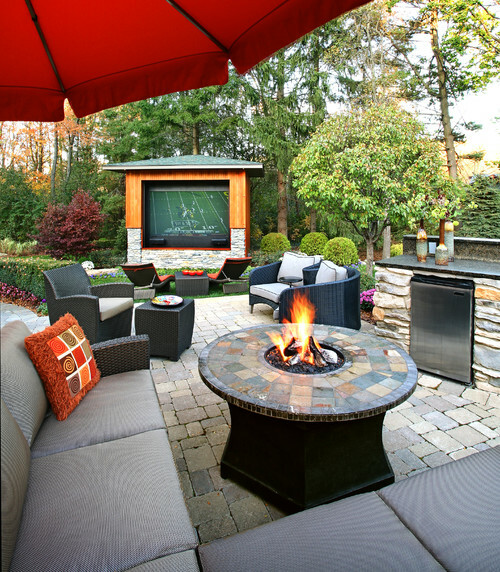 Building clever storage ideas into a landscape design showcases attention to detail while allowing homeowners to quit battling with their stuff. We’re talking about kids’ toys, extra cushions, patio furniture covers, firewood and things that are best stored out of sight. 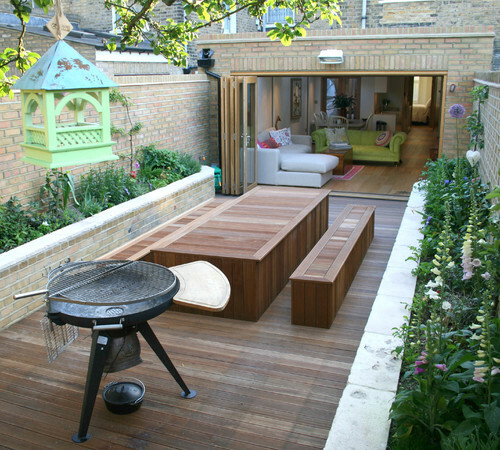 Fortunately, these days it’s easy to draw inspiration from those who have already thought of awesome solutions for making the most of spaces that might otherwise go underutilized. We bet that during good weather, these patio cushions provide extra comfort on the wooden bench area, a nice place to rest after gardening or sit with a good book. But how convenient that the cushions can quickly be popped into the storage cubbies below if the clouds indicate rain is on the horizon. We’re assuming that the wood is tongue-and-groove and waterproof. This is the type of clever storage that will blow your guests’ minds. Seriously. 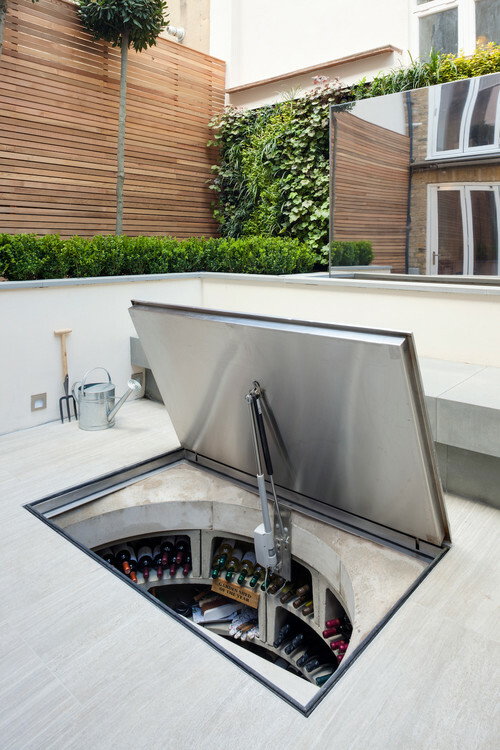 Why walk into the house for more when your backyard has a James Bond-like underground compartment full of wine for easy access in an outdoor dining area? Of course, keep temperature considerations in mind as you might need to wire in a cooling unit in warmer climates to prevent the wine from spoiling. There are companies who specialize in custom wine units like this one. Have garden tools at the ready by casting metal pipes in poured concrete that is covered by stones to give the ground a more natural look. Tools displayed in this manner won’t topple over, look more like works of art when cast on a plain background and are easy to grab and go. Plus, the metal pipes happen to blend in well with the metal staircase. Let’s face it. No one needs to see your trash cans, including you. The challenge is making sure that they are easily accessible inside their storage space, without the need to roll them out to open lids in order to place trash inside. Here, the wooden top is hinged to open in the same direction as the trash can’s top lid so you probably could lift both in one swoop. Have a beach house? This design is for you. 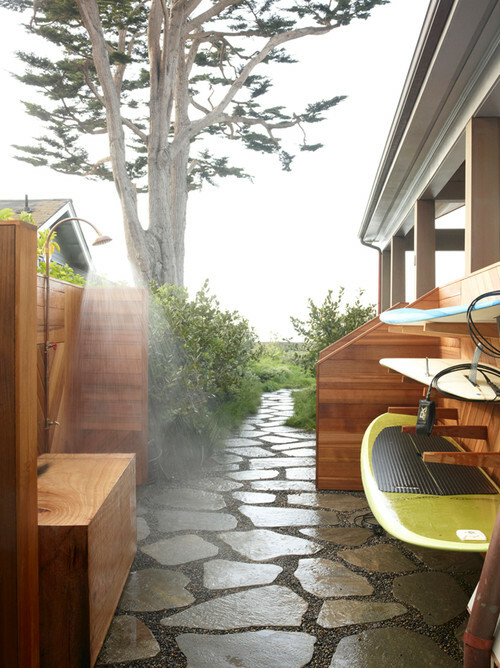 Mount surfboards near an outdoor shower for an easy rinse (of course, after rinsing the sand off of yourself). The wood (likely teak) warms the feel of the stone and keeps the surfboards out of view. Add a resort like feel to your outdoor living space, with an area where guests can grab pool towels at leisure without needing to forage through the house. A cut out space like this could also house a lovely succulent arrangement, a basket of sunscreen, blankets for a cold night or any number of other things. Gone are the days of eyesore sheds. 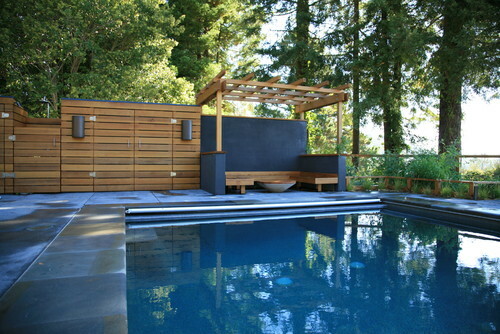 As mentioned in a previous post, modern sheds are in for extra storage and as ways to extend your outdoor living space. 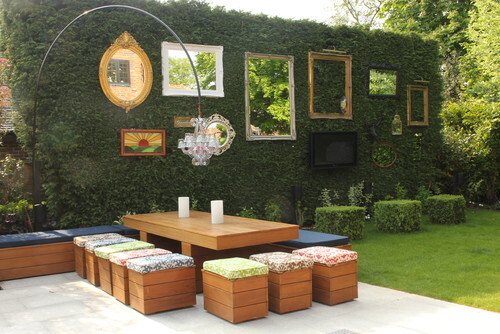 Homeowners are using them to house man caves, offices, extra bedrooms and then some. 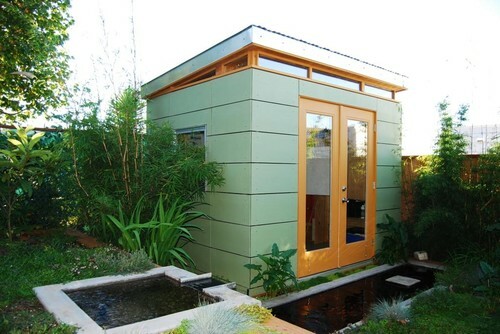 Attractive prefabricated sheds, such as the one above, are the most common way to go though you’ll need to be sure your shed of choice meets city regulations. Turn crawl space into storage for bulky or unusually shaped items. You just might have enough room for a kayak. This is just genius. 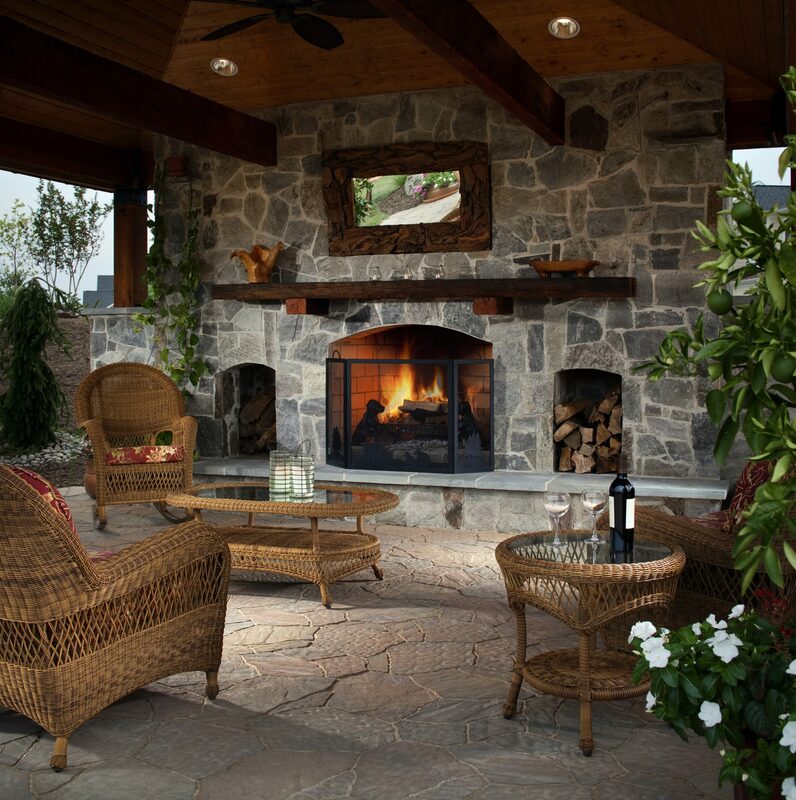 Those lucky enough to enjoy wood-fired pizza ovens and wood-burning fire pits will certainly have wood to store. 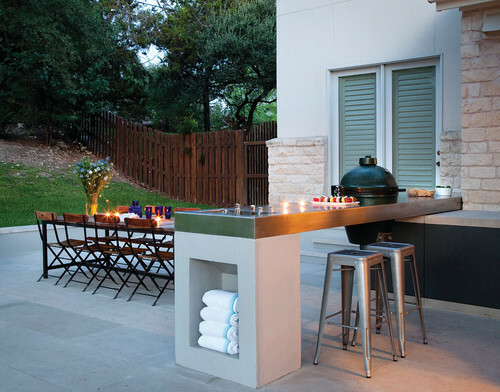 A number of outdoor kitchen areas, including those built with pavers (pictured at the top), have cubbies in their designs. 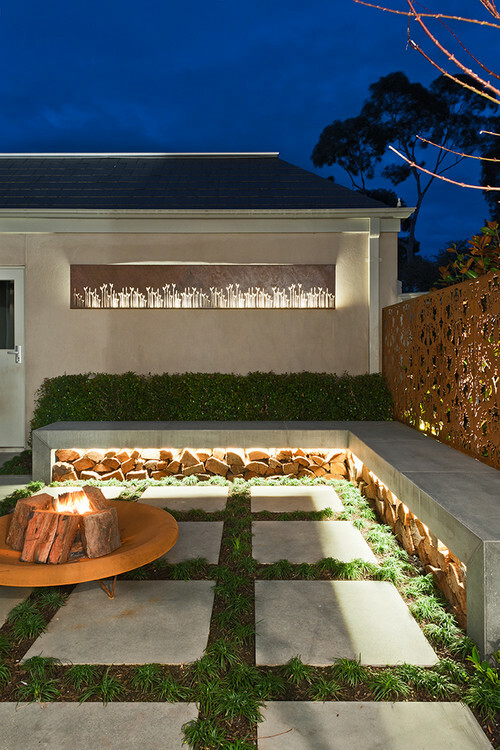 However, the homeowner above stores firewood under a concrete bench area in an uber glam way. The wood is backlit and actually ties in the decorative fence on the side. A closet here blends perfectly into the wooden wall and seating area. It likely hides pool equipment and toys like pool noodles and floats. We love everything about this cover storage area from the metal hinges and lack of door handles to the light fixtures. Well, it’s more like a TV hutch versus a place to actually store a television but it’s so cool that we had to show it to you just in case a big screen is in your master plan. Picture throwing the ultimate football party here. We’re sure there’s storage for cold brews around somewhere. Lift off the multicolored pillow tops to reveal empty cubes perfect for storing towels, patio furniture covers or whatever else fits inside. Keep in mind that they might rattle when moved and that you probably don’t want to pack them too heavily. Look out for furniture that contains secret compartments. 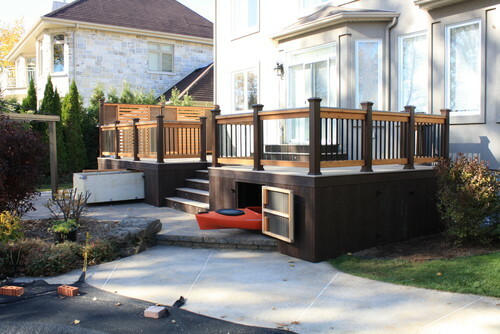 A number of table tops can be removed to expose a perfect place to keep outdoor entertaining essentials nearby. A good example is the bench and table pictured above. 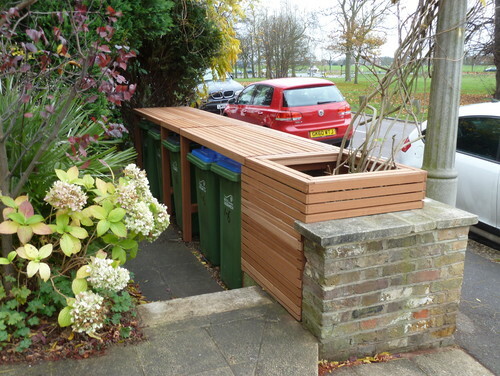 The tops of the custom sets come off to uncover plenty of storage space inside which is especially convenient in small yards. Plus, it looks fantastic, just like the other examples in this post. 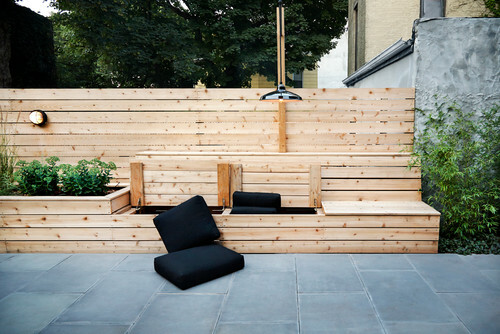 What kind of clever storage do you have in your backyard? 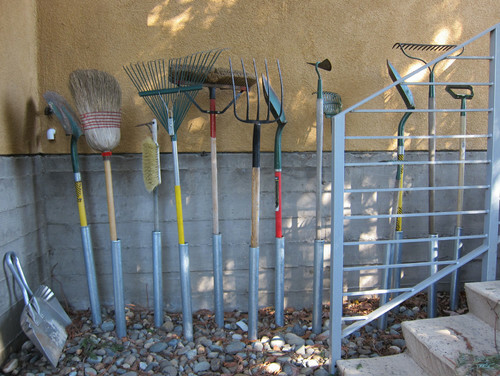 How Green Are Your Gardening Tools?